As all the good prebiotic and other fibre types in Barley+ pass undigested into your large intestine, and as your good gut bacteria use these prebiotics as their own food to build up more of their own good kind, they produce some of their own ‘wind’ or ‘gas’ . We’ve all been conditioned to think this ‘wind’ is a bad thing, but it can be an indication that the good gut bugs are fighting back. The trick is to introduce this good prebiotic fibre back into your diet slowly, to give the good gut bugs time to adapt to all the good stuff you’re feeding them. Follow our quick tips and step-by-step guide below, to reboot your gut in a way that’s right for you. 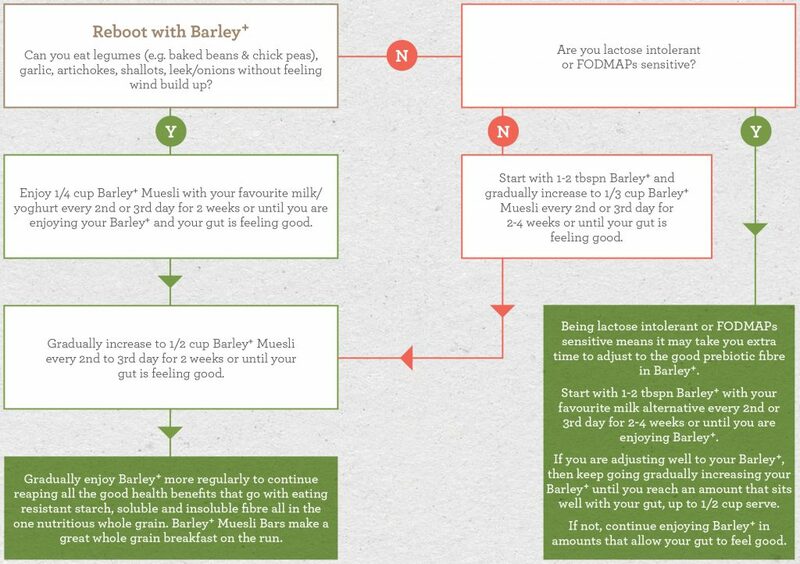 If you are finding the extra wind too much, reduce how much Barley+ you eat until your body slowly gets used to it… Below is a guide that may help.